We arrived at Elixir Art at night � 007-style, in a white speedboat (after a winding two-hour drive from G�cek marina). 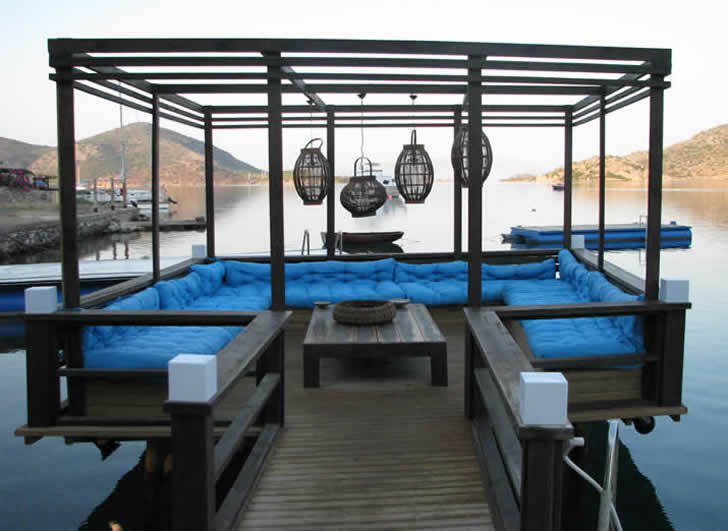 Captain Ferhan picked us up from Datca�s marina and whisked us across the glassy water to the hotel�s jetty, a sprawling wooden deck that�s a sunbather�s paradise by day and an alfresco candlelit restaurant by night. 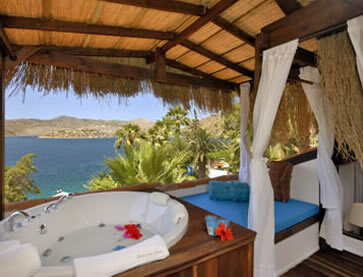 Each of the hotel�s 12 rooms opens onto the bougainvillea-framed deck, a stone�s throw from the water�s edge. Typically our days began with a sumptuous breakfast on the jetty comprising a savoury or sweet yoghurt, cheeses (both hard and soft), pickles and olives, an egg dish, a macedoine of fruits, and, of course, coffee. Our days were spent wallowing in the pale-turquoise sea, or lounging on the floating gazebo watching kite-surfers and kayakers waft by. Should you tire of lazing, the boutique hotel has an array of water-sports equipment, including kayaks and floating tubes. There�s also an outdoor table-tennis area on the upper deck. For the less intrepid, the reception area houses a large floor-to-ceiling shelf, stuffed with a wonderfully diverse array of books (many of which are donations from guests), as well as an assortment of board games. And if you came here to be pampered, there�s a sea-facing spa on the upper level ... At night, glitzy German tourists from nearby ships flock to the hotel�s alfresco restaurant. 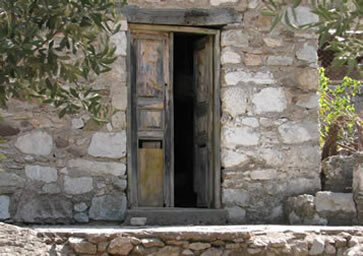 Originally known as Sabrina�s Haus, Elixir Art was founded by an intrepid German traveller, who on a visit to Turkey in 1978 fell in love with Datca and decided to start building a hotel here in 1985 (www.sabrinashaus.com for more). With its magical garden (planted by Sabrina and local gardeners), stunning sea-facing location and intimate size, this idyllic retreat is the last word in splendid isolation. Here, nature�s soundtrack of birdsong and jumping fish and the sweet smell of jasmine add to the seclusion rather than the designer d�cor. Sabrina�s Haus was taken over by a Turkish entrepreneur in 2006, who renamed it and is in the process of refurbishing the 14 rooms. The bathrooms, complete with Jacuzzis and showers with massage jets, have been given an overhaul already. 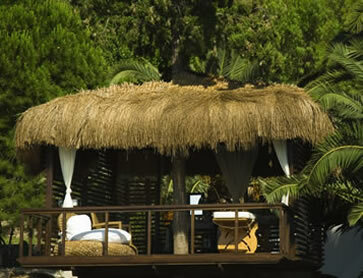 The new Orchid suite is now available, with its private terrace looking out over the water to the Greek islands. I�ve spoken about Turkish hospitality in a previous section and, once again, the dedication of Elixir Art�s hands-on, yet unobtrusive, staff deserves special mention. Asim, Jigo, Murat, Cemil and Halit were utterly committed to making our stay as pleasurable and relaxing as possible and because most of them have worked at Elixir Art for years, they have many interesting anecdotes and insights to share. The harbour village of Datca, which centres around a statue of Ataturk, is rather uneventful, save a few souvenir shops, restaurants and pubs. As an alternative to the official three-minute speedboat ride to the marina, we took a brisk 25-minute stroll into town, negotiating thickets of lethargic livestock along the way. 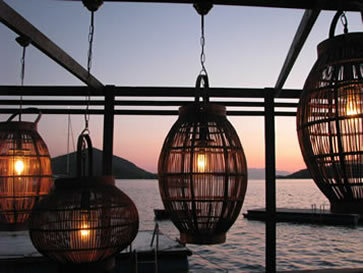 We sampled the fare at one of the one of the village restaurants but nothing that compared to the dishes at Elixir Art. If you�re looking to explore the area, Eski Datca (ancient Datca) is a 20-minute (cab) drive away; the bustling village of Marmaris with its bazaars, harbourside promenade and its recently refurbished marina is 75kms away; or there�s a thrice-weekly hydrofoil to the nearby Greek island of Rhodes.